https://laundrydetergentsettlement.com/Claim -you qualify if you purchased qualifying Purex Products between May 19, 2013 and March 8, 2019. No proof of purchase is required. https://secureweb.onlineclaimfilings.com/utz/ -you qualify if you purchased qualifying Utz Snacks or Bachman Snacks products between December 30, 2010 and March 30, 2019. No proof of purchase is necessary. https://secureweb.onlineclaimfilings.com/utz/ -you qualify if you purchase the qualifying Utz products between December 30, 2010 and March 30, 2019. No proof of purchase is required. 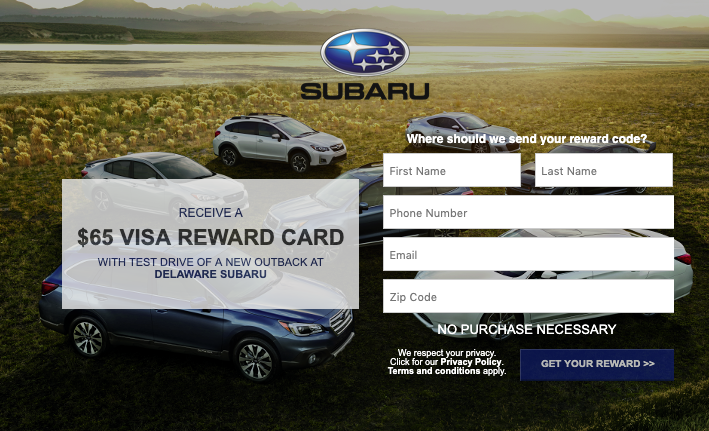 https://www.subaru.com/vehicles/outback/gallery.html -visit this page and look for the test drive offer that looks like this on the bottom right(you might have to be in an incognito window). Click that, then click the offer that pops up that looks like this and fill out the form. Bring the form into the dealer. This isn’t available in all areas, you also might have to click around the site a bit for it to come up. https://go.ganderoutdoors.com/rv/?scpc=go-now-open- – complete an RV walkthrough and presentation at participating Gander RV Sales location to receive the $25.00 Merchandise Certificate valid only at participating Gander RV Sales locations. https://www.hyundaiusa.com/test-drive-offer -visit this page and a box should pop up that looks like this. 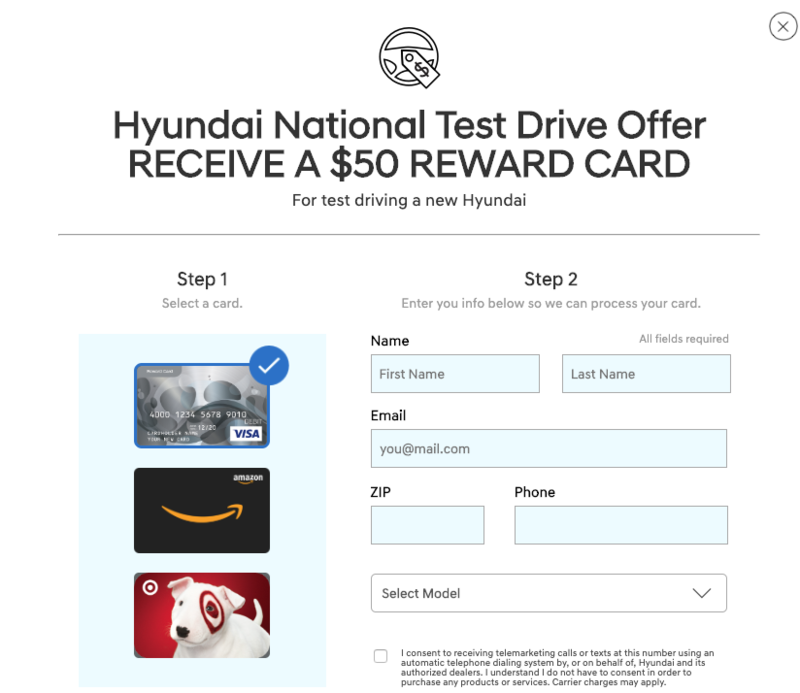 Fill out the form and test drive a Hyundai at a local dealer to get the $50 Gift Card. You can choose from Amazon, Target, or Visa. You might not be able to find this box in certain areas, and you might have to disable an ad blocker to see it. You can do these offers once per 6 months. Download the Menchie’s app for iOS or Android and register to get the reward. It doesn’t show up immediately. It should be good for 60 days.